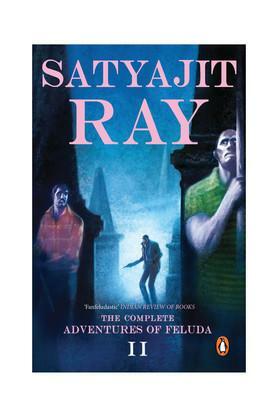 Nineteen gripping tales of suspense and mystery For readers who enjoyed the adventures of Feluda in Volume 1, this second omnibus volume holds more delights. Accompanied by his cousin Topshe and the bumbling crime writer Lalmohan Ganguly (Jatayu), Feluda travels from Puri to Kedarnath, from Kathmandu to London in his pursuit of culprits, he tracks down Napoleon's last letter, a forgotten painting by Tintoretto and a stolen manuscript. Satyajit Ray was born on 2 May 1921 in Calcutta. After graduating from Presidency College, Calcutta, in 1940, he studied art at Rabindranath Tagore?s university, Shantiniketan. By 1943, Ray was back in Calcutta and had joined an advertising firm as a visualizer. He also started designing covers and illustrating books brought out by Signet Press. A deep interest in films led to his establishing the Calcutta Film Society in 1947. During a six-month trip to Europe, in 1950, Ray became a member of the London Film Club and managed to see ninety-nine films in only four-and-a-half months. In 1955, after overcoming innumerable difficulties, Satyajit Ray completed his first film, Pather Panchali, with financial assistance from the West Bengal government. The film was an award-winner at the Cannes Film Festival and established Ray as a director of international stature. Together with Aparajito (The Unvanquished, 1956) and Apur Sansar (The World of Apu, 1959), it forms the Apu trilogy and perhaps constitutes Ray?s finest work. Ray?s other films include Jalsaghar (The Music Room, 1958), Charulata (1964), Aranyer Din Ratri (Days and Nights in the Forest, 1970), Shatranj Ke Khilari (The Chess Players, 1977), Ghare Baire (The Home and the World, 1984), Ganashatru (Enemy of the People, 1989), Shakha Proshakha (Branches of a Tree, 1990), and Agantuk (The Stranger, 1991). Ray also made several documentaries, including one on Tagore. In 1987, he made the documentary Sukumar Ray, to commemorate the birth centenary of his father, perhaps Bengal?s most famous writer of nonsense verse and children?s books. Satyajit Ray won numerous awards for his films. Both the British Federation of Film Societies and the Moscow Film Festival Committee named him one of the greatest directors of the second half of the twentieth century. In 1992, he was awarded the Oscar for Lifetime Achievement by the Academy of Motion Picture Arts and Science and, in the same year, was also honoured with the Bharat Ratna. Apart from being a film-maker, Satyajit Ray was a writer of repute. In 1961, he revived the children?s magazine, Sandesh, which his grandfather, Upendrakishore Ray, had started and to which his father used to contribute frequently. Satyajit Ray contributed numerous poems, stories and essays to Sandesh, and also published several books in Bengali, most of which became best-sellers. In 1978, Oxford University awarded him its D.Litt degree. Satyajit Ray died in Calcutta in April 1992.